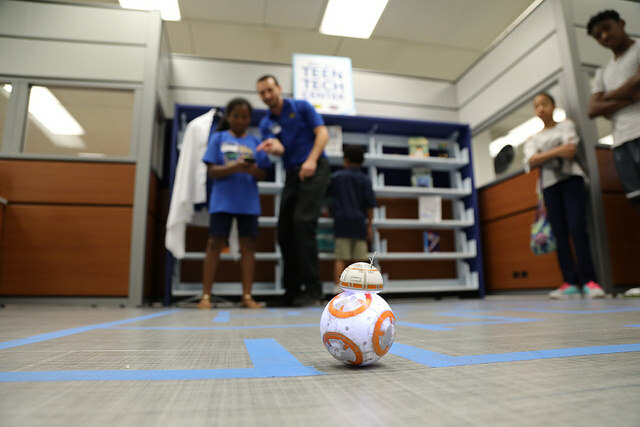 New Orleans Public Library recently added a new Best Buy Teen Tech Center located at the Main Library in downtown New Orleans. 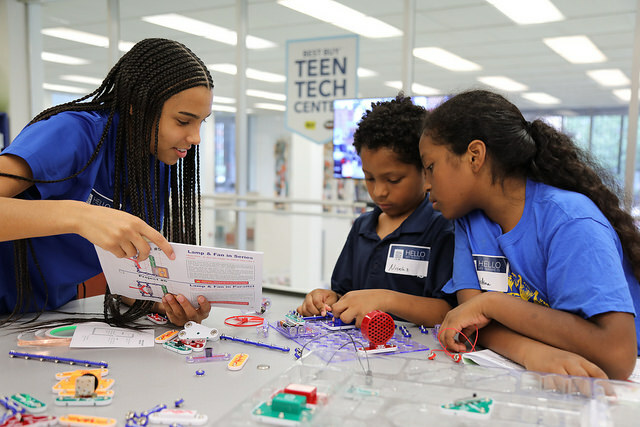 The grant funded center made possible by grant funds from Best Buy and The Clubhouse Network, a collaboration with the MIT Media Lab, is designed to help bridge the digital divide and support teens in becoming digital content creators. 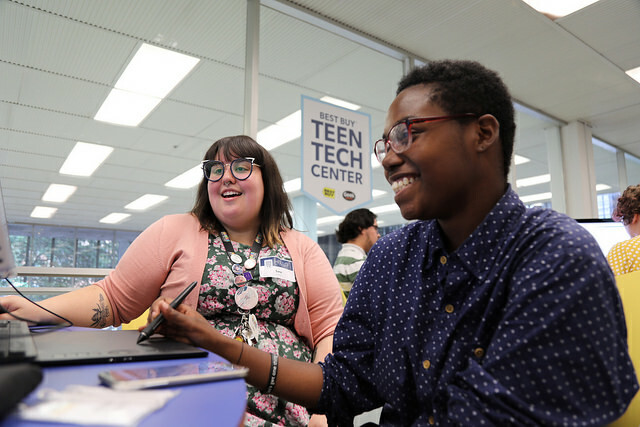 The new space includes a sound studio, sewing machine, green screen, HTC Vive VR, and an Ultimaker 3D printer as well as dedicated staff providing daily access to equipment and technology of interest to New Orleans teens. The program that teens and staff are most excited about in the center are the Wacom drawing tablets and Illustrator. Many of the teens coming in to the center are using the tablet and illustrator to create t-shirt designs and then screen print them at the library. 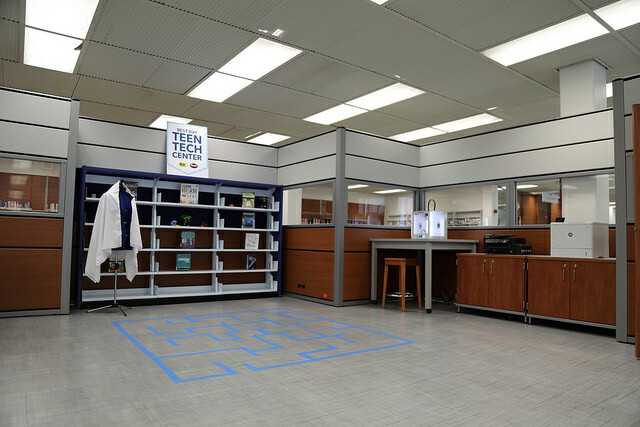 These tools allow them to go from concept to product at the library. Teens are also excited about the Vivitar 360 cameras and they are starting to make their own VR videos. Teens are also very excited about using the new sound booth at the library. Teens have to first get training in using the equipment and then they are able to use the recording equipment to create their own music. The soundbooth has been a big draw to the space and many teens who have never come to the library before are coming in to check out the new teen center. Most of the teens visiting the main library are using public transportation to get to the library. Almost every bus line makes a stop outside the main library which makes it an easy destination for teens. Teens have been spreading the word about the new space and many teens have come in to the center because they have heard about it from other teens or from the outreach library staff have done at schools around the city. The space currently has one full time staff person, but they are hoping to add another full time employee soon. 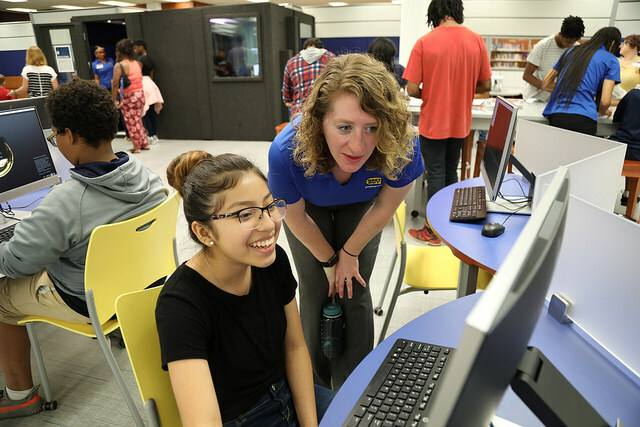 One advantage of being a Best Buy Teen Center is the professional development provided by the Clubhouse Network. This PD has helped Sara and Laura Bevins, Youth Services Supervisor, develop passive and active programs for teens. The Clubhouse Network also provides a closed social network for teens called the The Village. Teens can share their digital content in the Village and get feedback from other teens. This is a great new space for teens in New Orleans!